spectre007 Good chance to create your own epf stock... Otherwise no chance to own a PBB share... For me..
Keat Soon Ong Epf is dumping hopefully they can collect at Low price. I think as soon as epf stop dumping the share price will shoot up. Keat Soon Ong Look see first, never catch a falling knife, dunno this epf will dump till when, watching epf play movie. 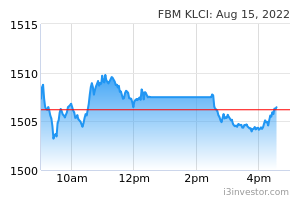 Kawkaw Epf dump because pbb have problem..
mybearmarket EPF keep acquiring, takut apa? Just buy! 888newbie Good time to top up. Meowoof What's the news, Krosineling? Please share. Thank you. Kawkaw I am waiting the like you..
mangotree AhHuat50, everytime you tell people to buy the stock will fall like crazy. Are you a fund manager trying to manipulate? zhen wei & JP Pbb Foreigners share holdings approx 15 billion left. mangotree why so many ahhuat spam? 4444 OPR must cut or PH ruling term cut short to 1 term? Michael Yeo When opr will be revised downward as forcasted? 4646 PBB got wat problem? Anti_banker Not only govn U-turn. Bankers also same. Buy call then push down stocks is their way. Anti_banker Bankers want job secured or higher profit? Michael Yeo Gonna fly soon after long consolidation. harrypotter12 anybody going to the agm? guanteik RM18? I really wished... because I’ll add more to my collection! No Trendline, UpDown,Z,M,N,W Reverse lines, U,F,O turns. On21 March 2019, ppb closed at 23.80, I had issued warning for pbb!!!! Pbb closed at 22.52 last Friday. Pls check all my history comment and my prediction always ahead market. dj idx, oil, klci …...many counters. if no support, then pbb hv another 80 cent to drop soon. ***** My prediction HIT !!! AhHuat50 EPF has accumulated 64,152,900 units share since 21 February. Equal to about RM1,550,000,000 in total. Trouble Huat collect for long term. SELL PUBLIC BANK & BUY SOME LANDED HOUSES BELOW RM300K WITH GOOD RENTAL BETTER!! KUALA LUMPUR: There will only be a minimal impact upon Public Bank Bhd should Bank Negara decide to lower the overnight policy rate (OPR), said its MD and CEO Tan Sri Tay Ah Lek. “There will only be a small and only temporary impact on the net interest margins which is insignificant compared to the overall earnings of the bank,” he said to a question at the company’s AGM in the capital city earlier today. “The temporary impact is due to the time lag for the repricing of the existing fixed deposits. This is a very insignificant impact to our earnings,” Tay added. KUALA LUMPUR (April 22): Public Bank Bhd says any impact from a cut in the overnight policy rate (OPR) by Bank Negara Malaysia (BNM) will have a minimal impact on its earnings. Speaking at its annual general meeting (AGM) here today, Public Bank managing director Tan Sri Tay Ah Lek said, "The OPR, if there is any cut, will be (a) small temporary impact on our net interest margin, which is insignificant on the overall earnings of the bank." "The temporary impact would be due to the time lag in the repricing of the existing fixed deposits, so there is a very insignificant impact to our earnings," he said. He added that 78% of the group's total financing portfolio are on variable interest rates, with the balance accounting for its fixed interest rate portfolio. "The variable rate portfolio, we have something about 78%, that's about it. The fixed rate portfolio, to a good extent, would mitigate our impact on the downward revision cut on OPR," continued Tay. The group's AGM was attended by 6,584 shareholders. At the midday break, Public Bank rose 0.1% or 2 sen to RM22.54 with 50.7 million shares traded. RedEagle KUALA LUMPUR (April 24): Malaysia Building Society Bhd (MBSB) Bank has launched a deposit campaign with total cash prizes of almost RM2 million in a bid to attract new customers. The PrimeWin RM1,000,000 CASA-i will run from now until April 30, 2020, and is open to the bank's savings and current account holders. The campaign carries a grand prize of RM1 million and total cash prizes worth close to RM2 million. Depositors have an opportunity to win the cash prize through the financial institution's monthly and quarterly draws throughout the campaign period. "With this campaign, we will be able to reward our current customers as well as draw new customers to experience banking with MBSB Bank," said its group president and chief executive Datuk Seri Ahmad Zaini Othman. Ahmad Zaini said the bank will be implementing further digitalisation of its operations, which includes introducing mobile application and digital branches to its customers. It will also introduce its first debit card, the MBSB Bank Visa Debit Card-i. On the relocation of its headquarters to PJ Sentral, Ahmad Zaini said: "The new building has our employees' best interests in mind. Not only is it a green building, it will have an activity-based workplace concept, a working environment that allows for collaborative workspace, (and) creative engagement resulting in a happy and productive workforce." "It will also be equipped with a creche, a facility that is not embraced widely by most companies in Malaysia," he added. At 3.55pm, MBSB's shares rose 0.5 sen or 0.51% to 98.5 sen, valuing the group at RM6.26 billion. Some 1.42 million shares changed hands.